Age-graded Bible study Sundays at 9:45 a.m.
Worship care and CLUB Sundays at 11:00 a.m.
kidFUEL (music and teaching) Wednesdays from 6:15 to 8:00 p.m.
During the summer Wednesday evening activities are provided for children of parents who are involved in on-campus activities. Kids 1 year old through 5th grade, send Mom and Dad away while you enjoy fun, kid-friendly activities here at Parkhills. Kids’ Night In generally meets one Friday a month during the school year from 6:30-10:00 PM. Cost is $15 for the first child and $10 for each additional child, with a family maximum of $45. Several times during the summer we provide a day of fun, kid-friendly activities at for children 1 year through 5th grade. Cost is $25/child per day. Spaces fill quickly, so register early! Kids who have completed Kindergarten through 5th grade learn about Jesus in a Biblically-sound and fun new way each summer. This core event evangelizes, disciples, and motivates kids using solid Bible truths, crafts, games, and large-group activities. 2019 "Summer Safari" VBS dates: June 17 & 18, 9:00 AM-2 PM and June 19, 9:00 AM -noon. Click HERE to register. Each year 3rd through 5th graders get away for a few days to deepen their walk with God, develop a love for His Word, and form strong Christian friendships. 2019 Preteen Camp information is available at the Welcome Center and at the kiosk in the Preschool area. Registration is now open! Click HERE to register. 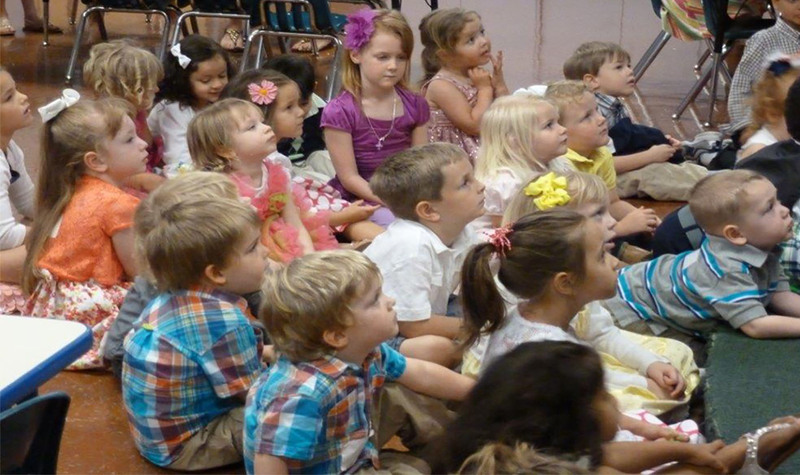 Learn more about our Children’s Ministry and view our preschool policies in our Children’s Ministry Brochure. Our Children’s Ministry is always looking for men and women with a servant’s heart who want to love our children with the love of Jesus Christ. There are many opportunities to volunteer including, but not limited to, Extended Session/Worship Care, Vacation Bible School and Sunday morning Bible teaching. If you’re interested in serving, contact Kelly.